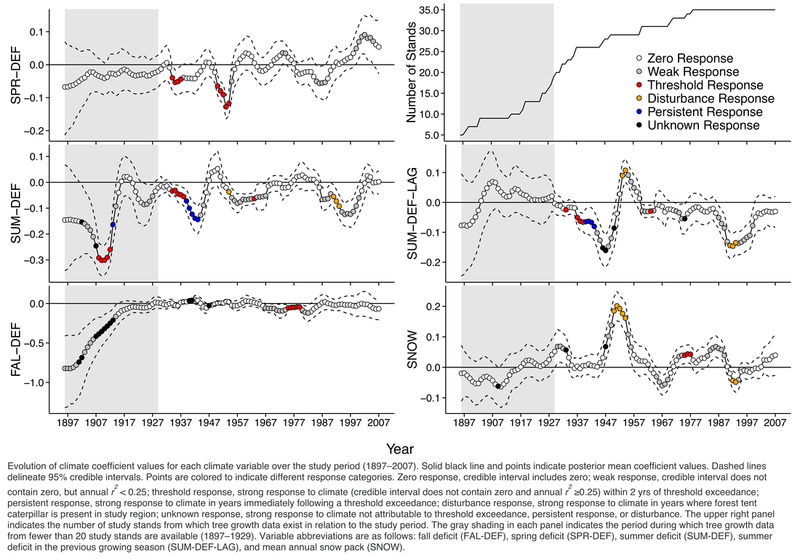 Changes in forest productivity in response to climate extremes, such as drought events, are difficult to predict due to potential due potential interactions with disturbance events and forest dynamics. Using an extensive tree-ring data set from northeastern Minnesota, we developed a dynamic Bayesian hierarchical model allowing the effects of climate on annual tree growth to vary over time and in relation to past disturbance and forest dynamics. Study forest stands were of varying composition, structure, and development stage and periodic forest tent caterpillar (Malascoma disstria) outbreaks led to defoliation of prevalent host tree species: sugar maple, paper birch, quaking and bigtooth aspen, and red oak. Model results indicated forest growth was most sensitive to climatic water deficit (difference between potential and actual evapotranspiration). 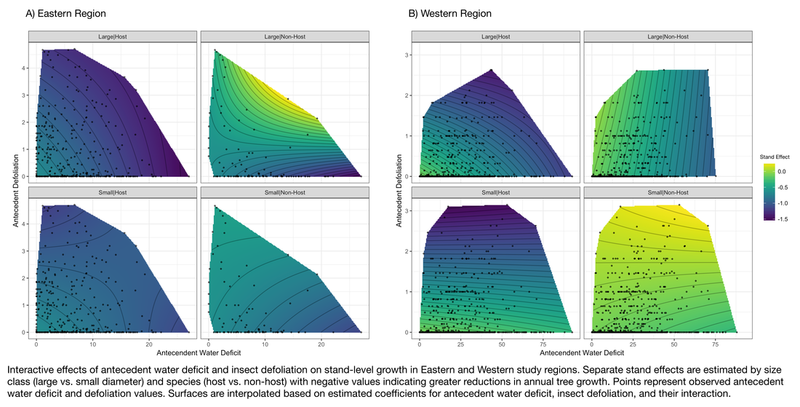 Forest responses to past climatic water deficit were partitioned into climatic threshold exceedances and interactions with insect defoliation. Forest growth appeared to be resistant to climatic water deficit with significant growth responses occurring only after multiple climatic threshold exceedances across seasons and years. Further, there was evidence of increased growth sensitivity to water deficit during years with forest tent caterpillar defoliation of host trees. In general, forest growth was most sensitive to past climatic water deficit during periods of high stem density following major regeneration events when inter-tree competition was high. Charcoal deposited and stored in lake sediments during and after wildland fire events can be used to infer historic fire regimes. In order to use sediment charcoal records to reconstruct fire history, charcoal deposited during local fire events must be separated from charcoal deposited from regional sources (i.e., regional fire activity). We developed a Bayesian point process model to estimate the probability of local fire associated with charcoal counts from lake sediment core samples and mean fire return intervals. The point process model utilizes Bayesian regularization to separate a regional, background deposition intensity, exhibiting low-frequency change over time, and a peak, foreground deposition intensity, exhibiting high-volatility over time. We extended the point process model to allow sediment charcoal records from multiple lakes to be combined in a multivariate framework to reduce uncertainty in local fire identification and estimate a regional fire frequency. The univariate and multivariate models were applied to data from a 13-lake network within the boreal forest of interior Alaska. Both models resulted in similar mean fire return intervals (100-350 years) with reduced uncertainty under the multivariate model due to improved estimation of regional charcoal deposition. Drought and insect defoliation have lasting impacts on the dynamics of the boreal forest. Physiological feedbacks in tree responses to drought and defoliation events amplify their impacts, which may worsen under global climate change, potentially causing large-scale productivity losses and forest mortality. We develop a Bayesian hierarchical model to estimate the cumulative effects of antecedent drought and insect defoliation stress and test for interactions among these important factors of boreal forest change. We apply the model to tree-ring data from boreal forest stands in Alberta (Western Region) and Quebec (Eastern Region) defined by differing regional climates (dry vs. mixed) and dominant insect defoliators (forest tent caterpillar vs. eastern spruce budworm). Values of antecedent drought and defoliation stress are derived from empirical, ecosystem memory functions, providing information on delayed and persistent forest responses to these ecological stressors. Ecosystem memory to past water deficit peaks in the year previous to growth in both regions and decays to zero within 5 (West) to 8 (East) years. Memory to past defoliation events ranges from 8 (West) to 12 (East) years. Antecedent drought and defoliation stress negatively impact tree growth with the largest reductions in large-diameter, host trees. We observe a positive interaction between antecedent drought and defoliation for large-diameter, non-host trees. This surprising result is likely due to reduced competition for limited water following severe defoliation of host trees. The frequency of extreme climate events (e.g., droughts) is expected to change over the next century. Managing forest ecosystems in the face of changing climatic conditions requires we understand interactions between climate and forest dynamics—changes in forest composition, density, size, age, and spatial structure over time. The role of forest dynamics in shaping forest responses to climate extremes is particularly important given forest dynamics can be modified through forest management. Analyses focused on modeling interactions between climate and forest dynamics face a data challenge. Tree rings provide sufficiently long records to model climate effects on growth, but provide little to no information on past forest dynamics. Repeat forest census data—periodic measurements of fixed sample plots—provide detailed measurements of forest growth, mortality, composition, and structure over time, but are rarely of sufficient length or resolution to understand forest responses to climate. 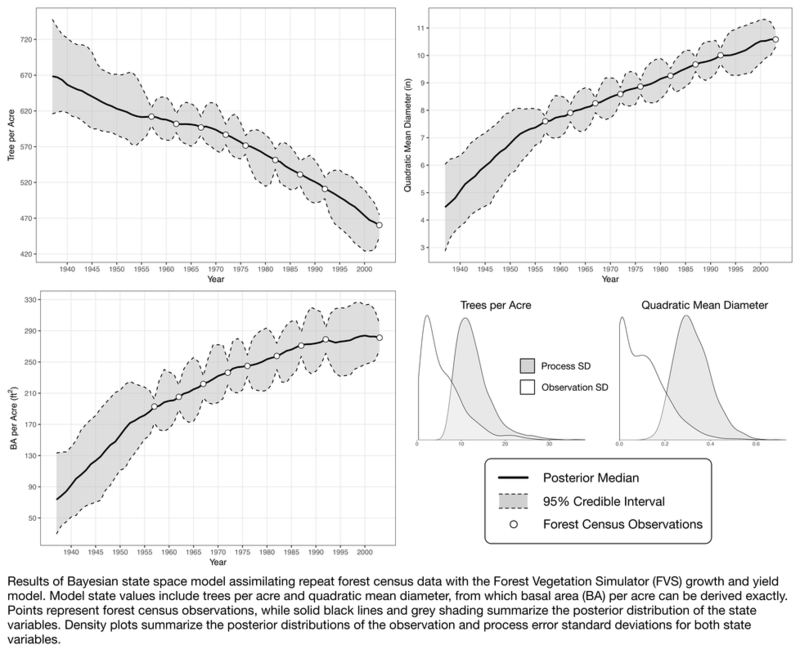 We nest a forest growth and yield model (the USFS Forest Vegetation Simulator [FVS]) within a Bayesian state space framework to assimilate tree-ring and repeat forest census data to model forest growth and mortality as a function of climate and forest dynamics. The state space model is applied to data from a long-term red pine thinning experiment in northern Minnesota.